The word “hieroglyph” comes from the Greek hieros (sacred) and glyphos (words or signs) and was first used by Clement of Alexandria (150 – 230 AD). The ancient Egyptians called them ‘mdju netjer or “words of the gods.” The first known example of hieroglyphic writing in ancient Egypt was discovered on bone and ivory tags, pottery vessels and clay seal impressions discovered in a pre-dynastic tomb in Abydos. The deposits are dated to between 3400 and 3200 B.C. The last example is from the temple of Philae, and is dated to 394 A.D. Knowledge of the hieroglyphic script was lost until the early 19th century, when Jean-Francois Champollion (1790-1832) used the Rosetta Stone to decipher the script. If you are interested on the subject some good literature is How to Read Egyptian Hieroglyphs by Mark Collier, Bill Manley as well as Middle Egyptian by James P. Allen and Ancient Egyptian Hieroglyphs by Janice Kamrin. Another very good tutorial can be found on YouTube in EgypthologyLessons’s channel. 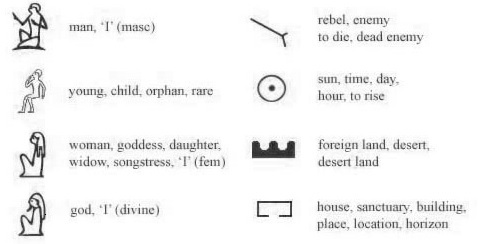 Visually hieroglyphs are all more or less figurative: they represent real or illusional elements, sometimes stylized and simplified, but all generally perfectly recognizable in form. However, the same sign can, according to context, be interpreted in diverse ways: as a phonogram (phonetic reading), as a logogram, or as an ideogram (semagram; “determinative”) (semantic reading). The determinative was not read as a phonetic constituent, but facilitated understanding by differentiating the word from its homophones. 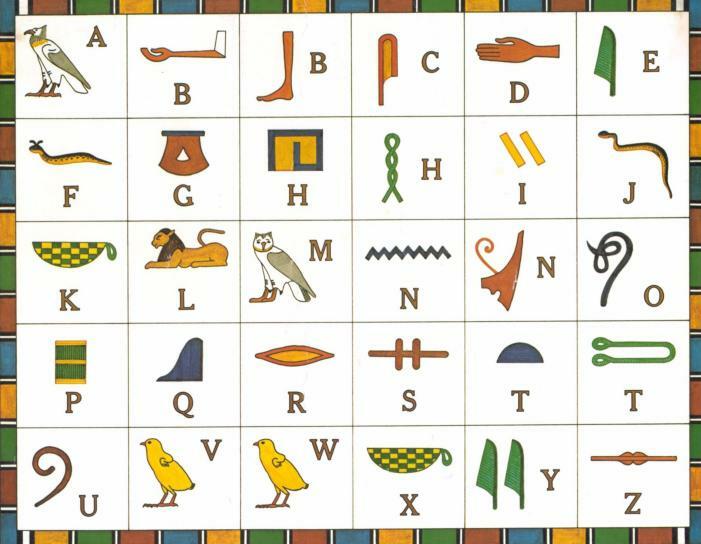 The English Egyptologist, Sir Alan Gardiner, arranged the hieroglyphic signs of Ancient Egypt into a number of sections in order to aid categorisation. For each symbol is associated with a letter followed by several numbers such as A21, G12, the later indicating the category in the Gardiner sign list. There are 27 different categories such as Birds, Mammals, Man and his occupation and a total of 821 different symbols. You can find additional information about the symbols in each category on the Wikipedia Gardiner’s page. Of course this sign list, though quite accurate, is actually hard to use in practice. Consider the word sky, encoded as Q1-X1-N1 would be very difficult to pronounce in any conversation about the meaning of a text. 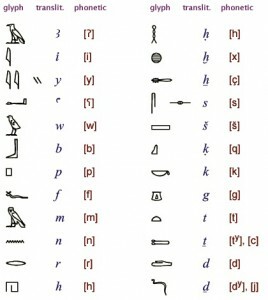 To help with this and to actually make a sound representation of the hieroglyphs transliteration is often used. Transcription, sometimes also called transliteration, is an international convention between Egyptologists to represent the consonants of hieroglyphic writing as a single Latin character. The advantage of this is that the pronunciation of a word becomes more clear. The problem with using this system is the way Latin characters are pronounced between in different languages, for example the sound ‘x’ might be rendered in English as kh and in German as ch, whereas the French would take ch for S. Or if one were to transcribe the verb sDm, “to hear”, as sdjm, one might think that it consisted of 4 consonants instead of 3, which might make a difference in the conjugation of that verb. The absence of vowels in hieroglyphic writing makes it impossible to know how the language of the Ancient Egyptians really sounded. Also, as Ancient Egyptians was a living language at some point in the past it evolved and changed. For example the transliteration of the name of the god Amun, dated to the 18th and 19th Dynasties, was Amaana, while the Greeks, some 500 years later, transcribed this name as Amoun. In addition, as long as the language of the Ancient Egyptians was a living language, it evolved and changed, just like any other living language. This is clear from its grammar and it is certain that this evolution also impacted the pronunciation of words. The cuneiform transcription of the name of the god Amun, dated to the 18th and 19th Dynasties, was Amaana, while the Greeks, some 500 years later, transcribed this name as Amoun. 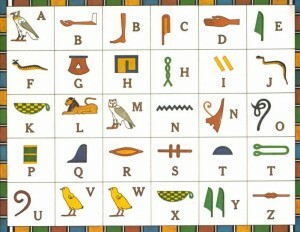 To cope with the fact that the Ancient Egyptian words are just represented by consonantal skeletons, Egyptologists have come to the following convention: A is read as a long a, i and j is read as ee in reed, a is read as a short a, w can be read as w or as oo in good and a mute e is placed between the consonants to make the words easier to pronounce. The Egyptian writing system is complex but relatively straightforward. The signs are divided into 3 major categories, namely logograms, phonograms and determinatives. can be the biliteral rw or occasionally the uniliteral l.
would be written as nfr+f+r, but also read as nfr, by adding 2 uni-consonant symbols. md +d +w (the complementary d is placed after the sign) → it reads mdw, meaning “tongue”. ḫ +p +ḫpr +r +j (the 4 complementarity frame the trilateral sign of the scarab beetle) → it reads ḫpr.j, meaning the name “Khepri”, with the final glyph being the determinative for ‘ruler or god’. nṯr with the vertical line near not bellow means “god” (the character in fact represents a temple flag). The determinative has no phonetic value, and so is not transliterated. It indicates the end of the word and provides you with further information concerning the meaning of the word. The determinative sign can be vital for translation as there are no vowels in hieroglyphics, and so a set of consonants could have more than one meaning. nfrw meaning “the beautiful young people” where w and the three strokes are the marks of the plural and the young boy is the determinative indicating babies and children. also nfrw but here the meaning “foundations (of a house)” because of the determinative of the house symbol. Tripling the nfr character is used to express the plural, hence the ending w of the transliteration. Read starting from the top left or top right margin, depending on the horizontal direction, the follow the symbols in horizontal order, then in vertical order if any symbol it’s available. Horizontal order can be left to right or right to left. Always try to read as if you are looking at the front of the symbols, for example try to see where a bird is looking and read as if you were in front of it. The same symbol can be rotated to be placed in a required reading order. Vertical order is always top to bottom, so you should not have any problems with it as it comes somewhat natural. Here are a few examples. Notice that the bird is looking left, so we should try to read as if we were in front of it, so from left to right. The Ancient Egyptian Cartouche hieroglyph-(as hieroglyph only) is used to represent the Egyptian language word for ‘name’. It is Gardiner sign listed no. V10, of the subgroup for rope, fibre, baskets, bags, etc. 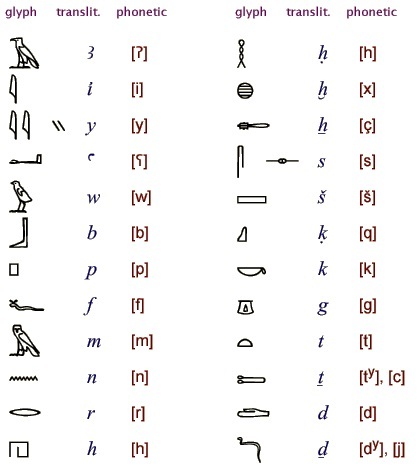 The cartouche hieroglyph is used as a determinative for Egyptian language šn-(sh)n, for “circuit”, or “ring”. Besides the cartouche hieroglyph use for the word ‘name’, the cartouche in half-section, Gardiner no. V11, , has a separate meaning in the Egyptian language as a determinative for actions and nouns dealing with items: “to divide”, “to exclude”. 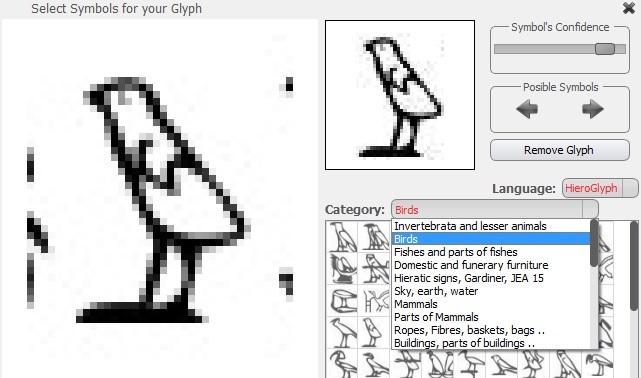 This is just a few things GlyphViewer application can do. If you are interested please download it from www.2glyph.com site. 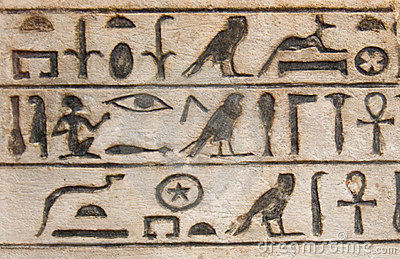 In the next article we will talk about Ancient Hieroglyph grammar such as: nouns, adjectives, pronouns, prepositions. This will help you become a better Glypher!